This is a view of the right-hand side of Loughborough Road, looking from the centre of Quorn towards Loughborough. 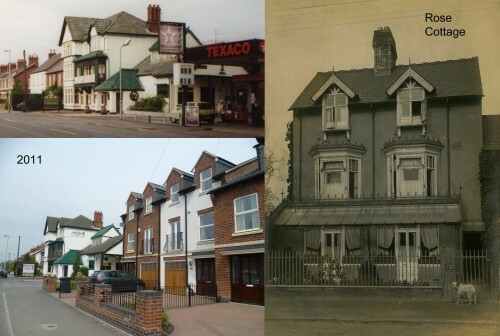 The large white and green house on the centre-left of the two colour photographs is ‘The Hurst’ (now the Royal Chequers Chinese restaurant). By contrast to the Hurst, the site to the right has seen far more change. Rose Cottage, a substantial property, was built in the 1800s and was occupied for over 30 years by the Clerk to Quorndon Urban District Council and property developer, George White. This attractive house was demolished in the 1960s and replaced by a petrol station. When the petrol station closed in the late 1990s the site was unoccupied for several years and became quite an eyesore. In 2007 the site was redeveloped and three new houses were built.